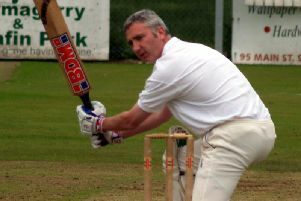 Graeme McCarter of the North West Warriors in bowling action against Northern Knights at Rugby Avenue on Sunday. Picture by Mark Jamieson. The Northern Knights recorded their second Hanley Energy Inter-Provincial Cup win of the month against the North West Warriors following a rain-affected three-run verdict over Bobby Rao’s men at Coleraine, on Sunday. Andy McBrine won the toss and asked the visitors to bat first, but it was to be a patchy innings that was eventually reduced to 39 overs after several interruptions for poor weather. Rassi van der Dussen provided the thrust of the NCU men’s effort with the bat; the CIYMS professional sharing in partnerships of 51 with James Shannon (31) and then 48 with Lee Nelson (18). That helped lift the Knights to 132-4 before van der Dussen upped the ante in the last five overs, hitting 7 fours and 2 sixes in his 96-ball knock of 93. Greg Thompson’s 13 not out allowed the Belfast outfit to close on 182-5 but the home side would have been far from disillusioned at the halfway stage. Stuart Thompson (2-49) was the most successful of the bowlers but skipper McBrine (1-20) was possibly the pick after an impressive 8 overs. Warriors’ openers David Rankin and Craig Averill gave the reply a solid looking start, but with the score on 42-0 after 11 overs the rain returned. Another delay meant the loss of 4 more overs and the new calculation saw the batting side set 167 from 35- 125 more runs needed from 24 overs. When play resumed the North West side found runs hard to come by as the Knights introduced trial by spin. Andrew White provided the breakthrough, bowling Rankin for 27 and then getting through danger-man Marco Marais’s defences as well as he went for 10. Gary Kidd was soon in on the act removing Stuart Thompson for 11 and then Craig Averill for a defiant 36 and from there on the hosts were struggling. McBrine did his best to keep on top of a rapidly increasing run rate as he and Ricky-Lee Dougherty (15 from 12) battled back but even the skipper’s defiant 27 not out wasn’t to be enough. A six from the final ball of the innings narrowed the final margin to just those three runs but the Warriors were undone by their ability to cope with the visitors’ spin options. Skipper White with 2-22 and Kidd 2-24 fared best for the winners but it was an impressive all-round performance from them as they take control of the one-day table.